The story before the story… What happened before A Family Affair began? Bestselling author Mary Campisi answers this question in her new Park Bench series. These short stories make the perfect park-bench read and are named after her signature park-bench covers. 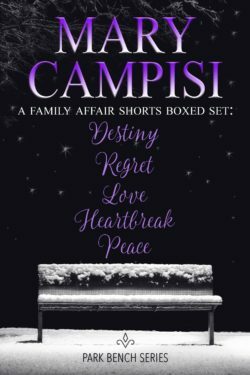 Book One: A Family Affair Shorts: Destiny. A chance meeting between Charles Blacksworth and Miriam Desantro in a grocery store becomes the key to the Truth in Lies series. Book Two: A Family Affair Shorts: Regret. Harry Blacksworth is filled with angst and guilt after sleeping with his brother’s wife. This affair fractures Charles and Gloria’s relationship. Book Three: A Family Affair Shorts: Love. Charles’s suffers confusion and indecision as he breaks off his relationship with Miriam. The birth of Lily brings hope and unconditional love. Book Four: A Family Affair Shorts: Heartbreak. When Gloria discovers her husband is having an affair, she vows revenge and grows bitter that life has not turned out as she’s planned. Book Five: A Family Affair Shorts: Peace. On the last day of Charles Blacksworth’s life, he promises Miriam that next month they’ll talk about the future. Nate admits his unwanted attraction to the woman in Lily’s photo albums–Charles’s daughter, Christine.